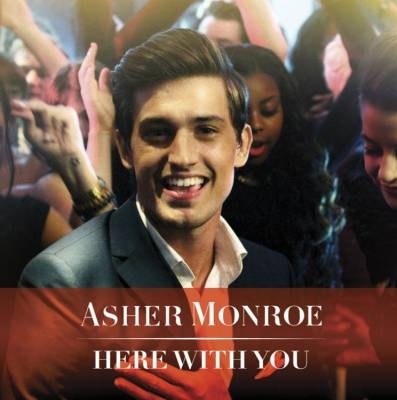 Singer-songwriter, actor and dancer, Asher Monroe debuted his new video for “Here With You” on MTV Buzzworthy at MTV.com, today. The infectious dance-pop anthem was co-written by Monroe and produced by Ryan Tedder (OneRepublic, Beyonce, Adele) and Noel Zancanella (Maroon 5, B.o.B., Demi Lovato). “Here With You” is available for download on iTunestoday. The track follows his sensational independent hit, “Every Night,” the music video for which surpassed 2.5 million views on YouTube. Monroe’s fans have followed his progress since his tenure as front man for the R&B-pop vocal group, V-Factory. Asher is also familiar to audiences as co-star of the 2009 motion picture Fame, as well as his reoccurring role in the NBC series Parenthood. “Here With You” will also appear on the forthcoming Asher Monroe debut solo album, a collaboration with Grammy-winning producer Ryan Tedder, which is shaping up to be a dynamic collection of beat driven, irresistible pop melodies.